Weathernews Opens World’s First and State-of-the-art Operation Center for Centralized Management of its Worldwide Weather Content Services –“Weather Street” Established in Chiba’s Makuhari New City Center– – Weathernews Inc.
Weathernews Inc. (WNI), the largest private weather information service provider in the world, opened today Weather Street, the operation center for centralized management of its worldwide weather content services, at its Global Center in the Makuhari new city center, Chiba City. Weather Street will provide weather information services meeting user needs in markets worldwide 24 hours a day, 365 days a year. Weather Street, which serves as WNI's global service center, consolidates global operations in what the company considers its ten principal businesses among the diverse weather information services it provides. It also consolidates the weather forecast division central to weather information services, as well as the database transmission, infrastructure management and other administrative divisions in a single place. The ten principal businesses consolidated in the center are mobile phone content service, air transport service provider support service, integrated shipping operation management service, sea-based work support service, distribution/retailing support service, media content service, road management support service, disaster prevention support service, railway operations support service and content service for the travel market. 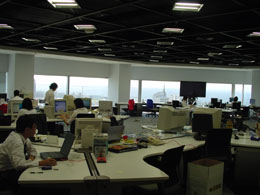 In providing weather information services, WNI adopts a global policy of "selling services locally and centralizing the operational management at the Global Center (Makuhari)." 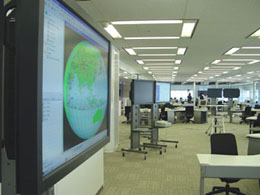 Carrying out sales and marketing activities worldwide on the principle of localization while centralizing service operations and development at the Global Center enables WNI to develop new weather content services flexibly and swiftly based on its corporate headquarters' latest technologies and also ensures close cooperation among the divisions and businesses through centralized staffing. WNI invested approximately 250 million yen in the establishment of Weather Street. By bolstering its worldwide services under the new system, the company aims to increase the percentage of overseas sales, which currently account for 30% of the total. In the future, in order to push its global business model forward and further promote the BtoS business for individuals and the public in general ("supporters"), as typified by the important mobile phone content service, WNI will improve and expand Weather Street to further strengthen its service operations.